School holidays have started here in Western Australia and I am lucky enough to be having a 2 week break from the day job. Unfortunately for Mr 17, he is in the middle of his Year 12 mock exams, and his final exams are only a few weeks away – so no holiday for him! Sarah celebrated the holidays by having some friends over yesterday. One of her friends has a gluten intolerance, so Sarah made up some meringues as a treat. They are a delicious treat and perfect for parties, afternoon teas and desserts. They disappeared very quickly – I had to be fast to get a photo. Preheat oven to 120° C. Line two baking trays with non stick paper. Whisk egg whites with electric beaters until stiff peaks form. Add the sugar, a spoonful at a time, until just combined. When all of the sugar has been added, whisk for a further 3 minutes or until mixture is thick and glossy. Place heaped tablespoons (or pipe using a pastry bag fitted with a star nozzle) of mixture onto the trays. Sprinkle with cachous and sprinkles as desired. Place in preheated oven cook for 40 minutes or until dry when the bases are tapped. Leave meringues in oven for a couple of hours to dry out. Edit: Thanks to one of our readers for advising that Cachous actually have wheat starch and wheat flour in them and are not able to be eaten by coeliacs. We are a bit slow this week with the Weekend Baking post (I blame our holiday mode!). If you have been baking this week, we would love if you linked up a photo of your baking and the name of the recipe below. Here is our Weekend Baking button if you would like to play along. How I loved meringues when I was a child! I’ve never actually made them though…must jot down this recipe! I’m never quick enough to take photos of my weekend baking…must try harder! Oh those meringues looks gorgeous! I made a strawberry pavlova yesterday which also disappeared very quickly! I wish I’d thought to take a picture! Sarah is so sweet!!! She is a wonderful friend! Have a lovely week, dear Lisa!! It looks delicious! I`m just baking a chocolate pear cake, it`s still in the oven but the house smells great already! They look yummy! Perfect for a girly gathering too 🙂 I tried your Passionfruit Lemon Butter recently – turned out wonderfully! YUM! They look delicious. I Love the cute touch of sprinkles too! 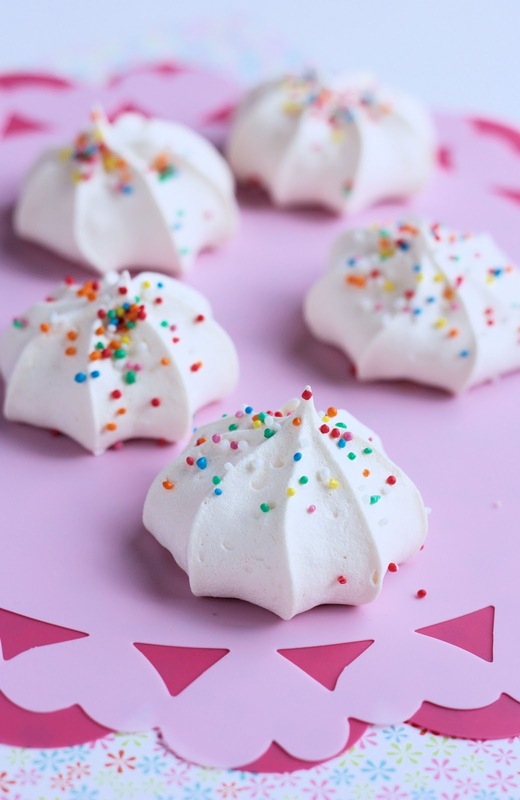 What a fun way to spend a school break, by making these gorgeous meringues. They look so perfect, and charming with the colorful sprinkles. forgot to mention, I bet these treats just melt in your mouth! we had meringues regularly as children, we had chooks so plenty of eggs. My brother could eat a whole batch! I love meringues, but do not because mey youngest son is allergic to eggs. I want a great and productive week for you. Not only gluten free but fat free as well. These are one of my diet foods..a special treat. Although sandwiching them together with cream doesnt count. oh yum and so very pretty. Thanks for sharing the recipe, this is something i have never made. An thanks you visit my blog! Hello there! I could have sworn I’ve been to this web site ahead of but right after searching by way of a few of the submit I recognized it is new to me. Anyways, I’m certainly delighted I discovered it and I’ll be book-marking and checking back again often! Cachous actually have wheat starch and wheat flour in them and are not able to be eaten by coeliacs – just a tip for the uninitiated….